Through participation in our society endeavors and through involvement with local partner organizations, our member physicians play an important role in addressing issues that impact the health of our community. Interested in getting involved? Contact Laura Polak or call (402) 393-1415. For the past several years, our member physicians, residents, medical students and clinic staff have collaborated on a two-day home building event to provide health homes for Habitat for Humanity families. No experience necessary. volunteers must be at least 16 years old. The Community Internship Program was established by the Metro Omaha Medical Society in 1992 to foster communication and understanding between community and business leaders and the medical community. Interns are provided the unique opportunity to shadow physicians, witness all aspects of care including patient examinations and procedures, consultations and even behind the scenes – including a variety of practice environments. The program culminates with a dinner where interns and physicians share their experiences. Past interns have included lawmakers, members of the media, community leaders and business representatives who work closely with physicians. For nearly a decade, the Metro Omaha Medical Society has hosted its annual “Speed Dating for Your Medical Specialty” event. 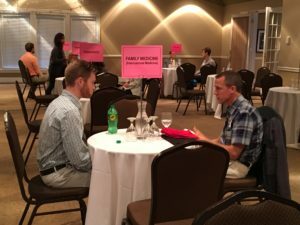 This unique and interactive mentoring event for Creighton and UNMC medical students allows students to visit face-to-face with member physicians, rotating every few minutes, to discuss their specific fields of medicine and the related challenges and opportunities. Students choose from nearly twenty specialties and are able to gain valuable insight into at least six potential specialties throughout the evening. Hope Medical Outreach Coalition coordinates the staffing of four clinics that provide health care to the indigent and low income population. Health care providers volunteer at these clinics or see patients in their own offices who otherwise wouldn’t receive care. The Metro Omaha Medical Society provides assistance to Hope Medical Outreach Coalition in their ongoing efforts to identify potential physicians volunteers in those specialties with the greatest need.